Skipping over the preliminaries following the merge, we go straight to the reward challenge, which re-divided the Survivors back into two temporary tribes. It was another in the endless series of obstacle course/puzzle pieces challenges. The reward was pizza and beer and a "secret note." The orange tribe won. Not the tribe with Tarzan, Jonas, Leif, Michael, and a few others. I still don't know all the names this season. Uhh ... also Sabrina. And Chelsea. The secret note told the temporary tribe that there was another hidden immunity idol at camp. Jonas and Tarzan had a big argument. Sadly, it wasn't over the blue bikini briefs that Tarzan was wearing. Troyzan found the individual immunity idol very quickly. I know I'm in trouble as the preview said the teams are headed to Aberz.... Aserba ... France. OK ... Azerbaijan. Which is going to be copied and pasted here from now on. When we last left the Racers, they faked us out on Mark and Bopper getting eliminated in an emotional scene. Teams made their way to Bavaria. Team Border Patrol had a 3-hour lead on the next closest team, which in this race can be negated instantly by a clustering at an airport or whatever. Nonetheless, they were the only ones on the train into Germany. 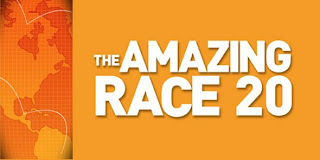 Kerri and Stacy were almost 8 hours behind the lead team, and Mark and Bopper were more than 9 hours behind and have a speed bump. Teams departed Paraguay for Italy. Mark and Bopper immediately were given the "Uh-oh, they're getting eliminated" edit when we learned that one of them has a very sick daughter who is on seven different respiratory medications. Their fate appeared even more doomed when they went to the airport instead of to the travel agent. And then they got on a later flight behind all the other teams. At this point, I'm thinking just eliminate them now, 10 minutes into the show, and I can go watch something else. I love making myself cafe mochas on the weekend. But I feel a little guilty using store bought chocolate syrup because of the sugar content and calories. The sugar-free Torani coffee syrup is fine but not spectacular. And buying special diabetic sugar-free syrup is really expensive. This morning I found this blog with a super easy home made chocolate syrup recipe. We had some Baking Splenda in the cupboard so I substituted it for the sugar and literally (in the proper use of the word) whipped up a batch in 5 minutes. Seriously. Kraft Dinner is more complicated. And it's delicious, too. My afternoon mocha was great. So no more buying chocolate syrup. Sorry, Nestlé. A quick review, as the show was on last night. The girls won the reward challenge and got a tarp. There was lots of talk of a momentum shift but the girls' winning streak ended at three as the men won the immunity challenge. There was great drama on the men's tribe when Leif told Bill that he was next. And Bill confronted Colton who went bonkers. Then Colton decided to give away immunity and go to Tribal Council to vote out Bill. This was met with great cries of "WHAT!?" from his tribe. Then Tarzan claimed that they should go to Tribal to vote Leif out. And, indeed, in perhaps the single dumbest move ever in Survivor history (hey, Jeff just said it, too! ), the men GAVE UP THEIR IMMUNITY to go to Tribal Council. Jeff was aghast. Then Bill called it the single dumbest move in Survivor history. So, yeah, it's the single dumbest move in Survivor history. Sorry, folks. 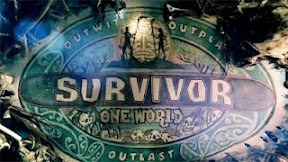 Due to a prior commitment, Survivor will have to wait a day. Hopefully, I can watch it tomorrow night on VOD and put up a short review then.